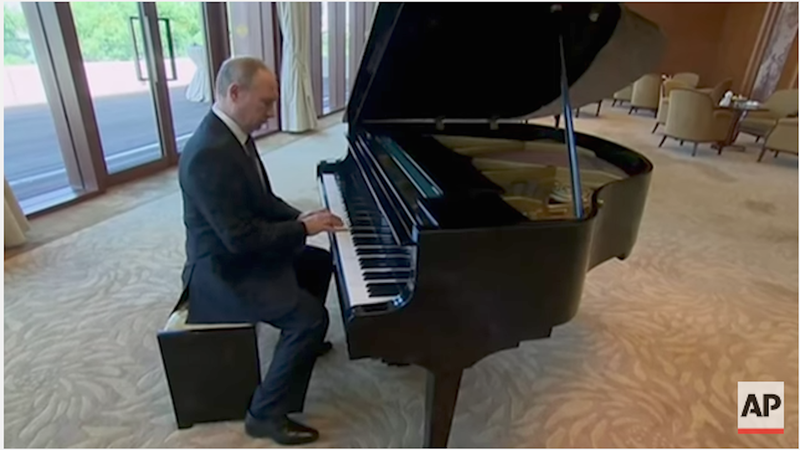 Not to be outdone by Persian cat-loving Bond villains, or Hannibal Lector’s famously exquisite tastes—barring the one he harbors for human flesh—Russian president Vladimir Putin has demonstrated his appreciation for a well-tuned piano. As the Associated Press reports, Putin pecked away at both Moscow’s anthem and that of St. Petersburg—the latter his native city—while waiting to speak with Chinese president Xi Jinping. He was in Beijing, China on Sunday, May 14, for the occasion. Perhaps you’re wondering, was Putin any good? Really, it shouldn’t matter. The Russian dictator has cultivated an oppressive regime where his dissidents, including journalists, are murdered or sent to Siberia, minority communities are brutalized, and domestic violence is legal. He also provided significant military aid to Bashar al-Assad as the Syrian dictator massacred Aleppo’s rebel stronghold. But for the record, no. His ability seems mediocre at best. Nonetheless, the New York Times tweeted out news of Putin’s ivory tickling in an unsettlingly gushy manner. Oh, his “softer side.” Sure. I suppose one cannot orchestrate assassinations all the livelong day. One might think that Donald Trump composed these tweets—after all, he has not masked his affection for the Russian dictator. However, we’re well aware that when it comes to the art of written expression, our president is none too skilled.